Bolster pillows and cushions are elogated cushions for chairs and settees. elongated, rounded cushions for that extra comfort. Bolster pillows were in fact the beginnings of the modern day pillows and scatter cushions. They are elongated with rounded ends to give a cylindrical shape. Originally they were used to give support to the head when sleeping. It provided a firm base that fitted the width of the bed and then softer pillows placed on top. The filling was usually feather and down as this gave the support needed. In earlier years they were stuffed with straw or horsehair to give a firm cushion and these were then used along the sides of wooden chairs. Although nowadays these have a much softer filling. Overall these were used mainly as decoration and some could be quite ornate made from heavy fabrics with tassels and other finishing touches. These cushion styles are making a comeback as they can be fitted into the back and sides of chairs or settees to give extra support. Also they look good placed on top of the bed. Another good way in using these cushions is at the back of a wooden garden chair as these can be too upright in their design and not enough support for the lower back. By adding an elongated cushion extra comfort is given. Gathered around the seam or just in the middle of the end. Pleated from the side to the middle. Made with an elongated end and then tied closed. This design can be used to make the inner pad and then also used to make a cover to go over the pad. They could also be made without the pad inside and just the outer covering holding the filling. If this type was made then the whole cushion would have to be washed so this may determine the type of fabric used. 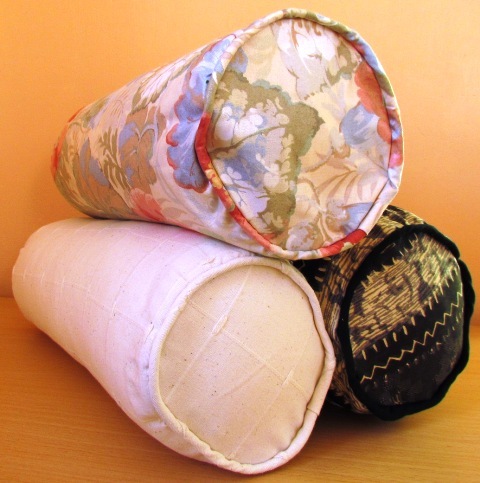 Buy making some extra replacement covers the look to your elongated cushions can be changed regularly if wanted. If you don't want to make the inner pad, many shopping outlets such as Homecraft have them and I have got a selection of inner pads to buy from Amazon.